Design By Chris is the name I'd worked under before I'd moved onto working under the CakeNeq Games name. Originally the intent was that DBC was retired because a new person was coming on which we felt warranted a new 'team'. In the year+ since DBC was retired, the namesake has passed on, so I thought it'd be a good time to consolidate the games made under Design By Chris, at least for archival's sake. This was the first game I made and released as DBC, it's really the earliest game I made that was even close to being a real game. Despite having made a few games before, I still had no idea what the hell I was doing. I had ambition, a copy of GameMaker 8.0 and no clue how to really make a game. The idea is simple, shoot at the other guy, but good god are the controls awful and the graphics are somehow worse than that. The game isn't anything even resembling good, but it'll always hold a special place in my heart being my first, and being born from a somewhat tumultuous time in my life. In the end, I'd like to think that I'm the only one who remembers it, and I'm certain I'm the only one who remembers it fondly. I've never made music for my own games, and the tracks on Kinigits are all from a fantastic chip-tune artist who goes by RadicalPresident or Chasing Bleeps depending on where you are. I'd recommend his music to anyone who likes chip-tune, his newest albums are among my favorites. Super Skele Massacre was supposed to have story. Complete with locations, races, long standing conflicts, all that great high fantasy junk. All told, it's probably good that things went down the way they did. The release version is unfinished. There's an end, and all the game-play works, but it's even more unpolished than I wanted, it also doesn't have the 6 levels it was planned to have. The entire reason this version exists is due to some punks in San Francisco. One lovely night while on vacation with the family, the aforementioned punks decided it'd be cool to smash our car's window, and boost my laptop which contained all the source code for SSM and a few other prototypes. I decided that the game wasn't worth completely rebuilding from scratch, so instead, I decided to release the the early build I'd packaged before leaving on the trip. It sucked, but it did teach me some important lessons on backing up source code, lessons I adhere to still today. 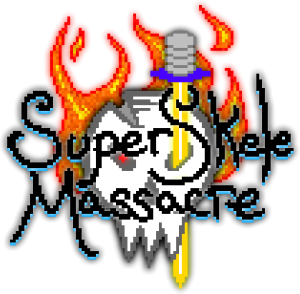 The music for Super Skele Massacre came from a good friend of mine, Jeffrey Typpo. He doesn't regularly produce music, though he does make tracks from time to time as well as playing in a local band. He's pretty damn great, as with all of DBC's productions, music is the highlight by far.